Michael Jones teaches at Oakland High School in Oakland, CA. 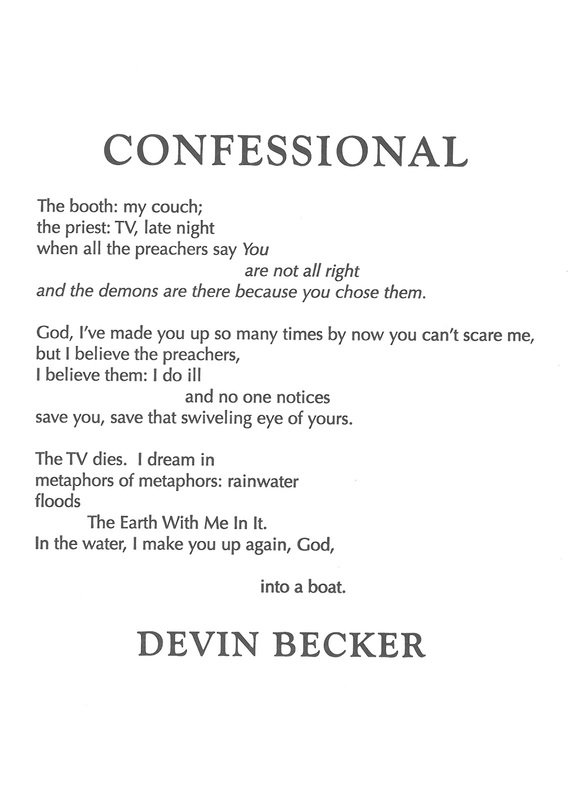 His work appears in Atlanta Review, Beloit Poetry Journal, and other places. He tries to be a good neighbor. 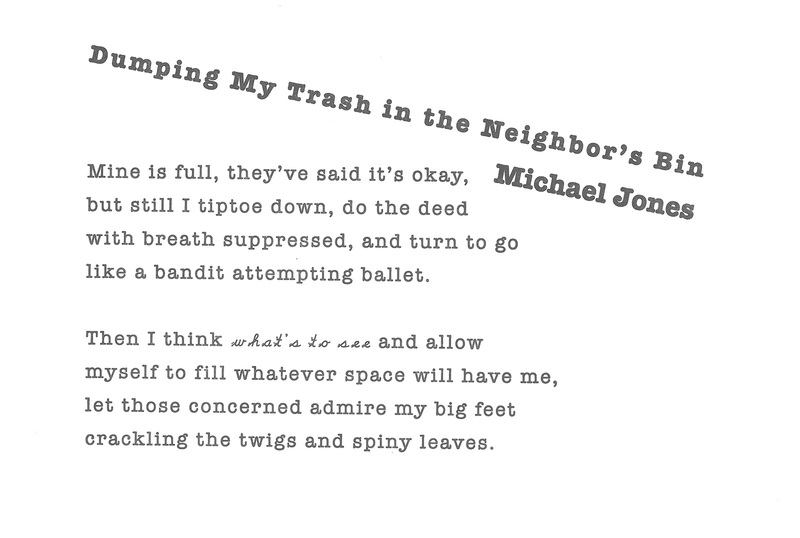 Yes, poems really can be about anything, even taking out the trash. Really, though, this one’s about that question: what’s to see? It’s a corollary to whose business is it, anyway? How many times have you felt a little funny, say, letting yourself into your neighbor’s home because they’ve asked you to water their plants or feed their cat? Maybe you decide to try a new coffee shop and catch yourself feeling like you’ve cheated on your regular spot. Whatever forms they take, ideas about where we do and don’t belong are durable and sometimes outlive their usefulness. So asking what’s to see can be a liberation. In a short poem such as this, it functions like a haiku, where, in the silence after the poem, that expansive feeling of “filling whatever space will have [you]” is what matters most. Typewriters and practice with cursive handwriting are two things that have been discarded in the digital age; their representative typefaces serve here as evidence of what might be going into the trash. 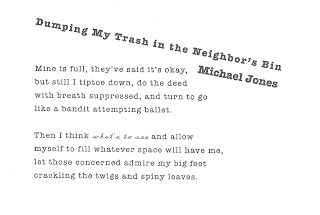 The arrangement of the title and poet’s name mimics the lid of a certain style of trash receptacle currently ubiquitous in cities and suburbs alike. Amy Wright is a 2012 fellow of the Kenyon Review Writers Workshop, the Nonfiction Editor of Zone 3 Press and Zone 3 journal, as well as the author of three chapbooks—Farm, There Are No New Ways To Kill A Man, and The Garden Will Give You A Fat Lip,which won the 2012 Pavement Saw Chapbook Contest. “Just to be clear” a poem’s speaker can have a very different agenda than the poem itself. Amy Wright uses that to good effect against one of the uglier bits of human nature: our need to judge each other’s differences. Her speaker starts off well enough, able to see through phrases like “not to be racist” and to understand how stereotypes erase nuance. 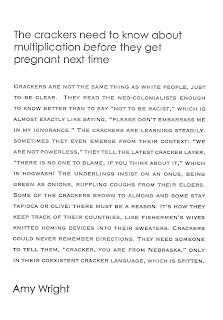 (The term “cracker” originally referred to slave drivers who were mostly white but not exclusively so.) 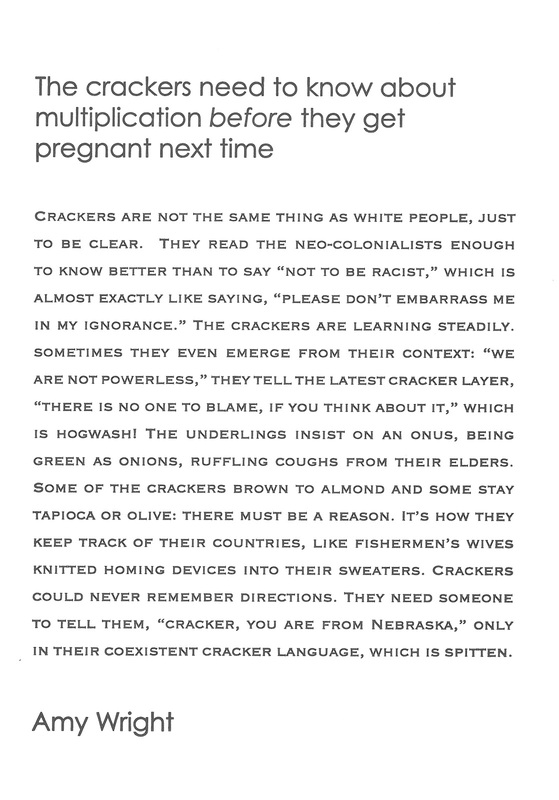 But the repeated use of the word “cracker” quickly slips it back into stereotype, which is where the poem’s agenda diverges from the speaker’s. What’s heartbreaking is that the speaker doesn’t seem to realize what’s happening, that with every “they keep track” or “they need someone” she distances the group she’s describing until they’re merely “coexistent,” lacking any common ground. So while the speaker pigeonholes a group into a stereotype, the poem seeks to expose how insidious those racial stereotypes are. It’s a disturbing poem because we have so far yet to go. Copperplate’s small caps read like a shout and reinforce the poem’s indignant tone. 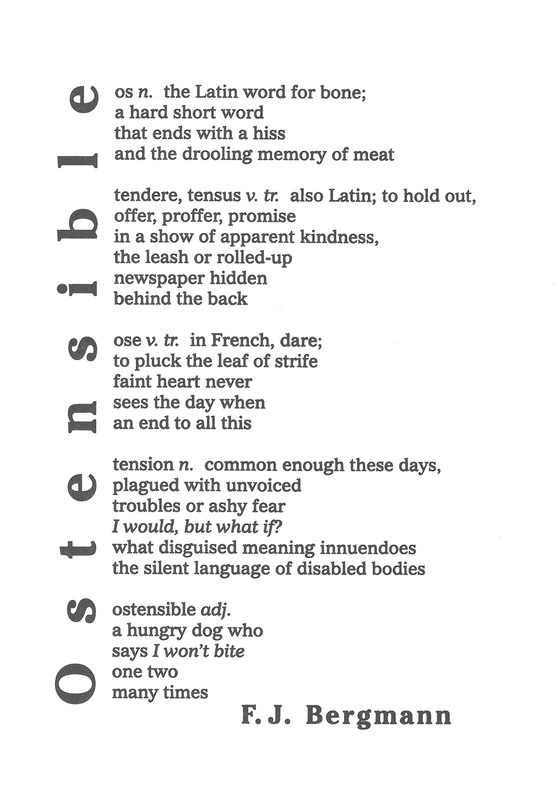 It’s letters are blocky, too, each of them a tiny version of the large block of text that is this poem’s body. It’s a visual brick, heavy, like the subject matter. The length of the title required a typeface that had open bowls similar to Copperplate, but lighter; Century Gothic strikes that balance. F.J. Bergmann frequents Wisconsin and fibitz.com. She has no academic literary qualifications, but hangs out a lot with people who do. Publications where her work has appeared include Asimov’s Science Fiction, Eschatology, Mythic Delirium, Strange Horizons, Weird Tales, and regular literary journals that should have known better. She is the editor of Star*Line, the journal of the Science Fiction Poetry Association sfpoetry.com, and the poetry editor of Mobius: The Journal of Social Change, online at mobiusmagazine.com. Chapbooks includeConstellation of the Dragonfly (Plan B Press, 2008),Aqua Regia (Parallel Press, 2007), and Sauce Robert(Pavement Saw, Press 2003). Out of the Black Forestis forthcoming from Centennial Press in 2012. One of her pseudopodia can reach all the way from the bedroom to the refrigerator. Her hairstyle is deceptive. Devin Becker is the Digital Initiatives Librarian at the University of Idaho. His poems have been published in Cutbank, The Pinch, Faultline, and other fine journals. His article on the digital archiving practices of writers, co-written with Collier Nogues, is forthcoming from American Archivist. Late nights are for wrestling with fear, be it consciously or otherwise. 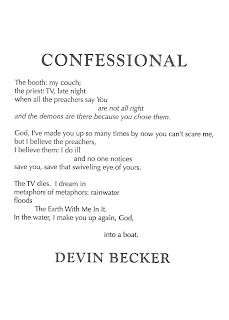 Devin Becker’s poem has all the likely suspects: preachers of fire and brimstone, the TV, a god that does and does not exist, water that gives and takes life. The speaker knows he “is not all right,” he “do[es] ill/ and no one notices,” but he also understands how much he doesn’t know. 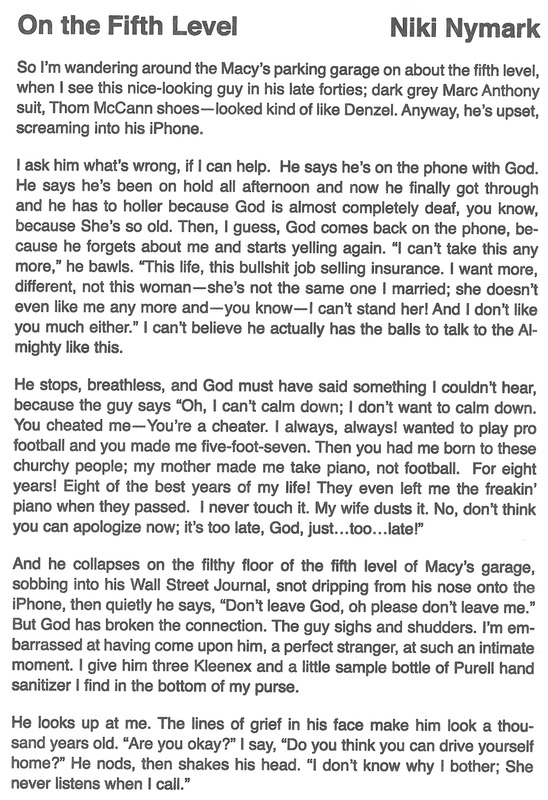 (How well could anyone really understand a dream state full of “metaphors of metaphors”?) Perhaps that’s the point: there is no knowing. 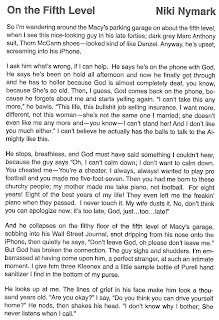 And does it even matter, when the god we feel we’ve made up saves us yet again? It matters to the speaker, who by the poem’s end, is in God’s boat. The indented lines plus the very long middle line create a visual back and forth effect more pronounced than when text is entirely flush left. Centering and kerning open the title and poet’s name reinforce this effect. It’s all with an eye toward the physical space of the confessional, with its curtains that slide open and closed around each act. 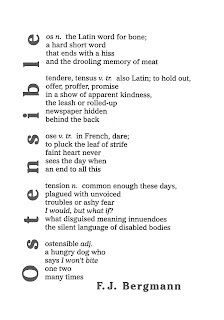 Optima occupies the tiny gray area between seraphed and unseraphed typefaces, an appropriate choice for a poem about a space that both is and is not a true confessional. Lisa J. Cihlar’s poems have appeared or are forthcoming in The South Dakota Review, Green Mountains Review, The Prose-Poem Project, In Posse Review, and Blackbird. She is the author of two chapbooks, The Insomniac’s House (Dancing Girl Press, 2011) and This is How She Fails (Crisis Chronicles Press, 2012). She lives in rural southern Wisconsin. Poets love lists so much that it can be hard to make a truly fresh one, but Lisa Cihlar has managed it. First, she pulls us in with a vivid inventory of organic detritus. Her speaker is fascinated with the kind of remains that quickly disintegrate or blow away; she lingers on beauty and grossness, the remarkable and the mundane in equal measure. And then there is the glue gun. Just as the speaker uses it to create a new self, the poet uses it to transform the poem. What was previously cast aside gets incorporated into a new whole: “my fresh self. 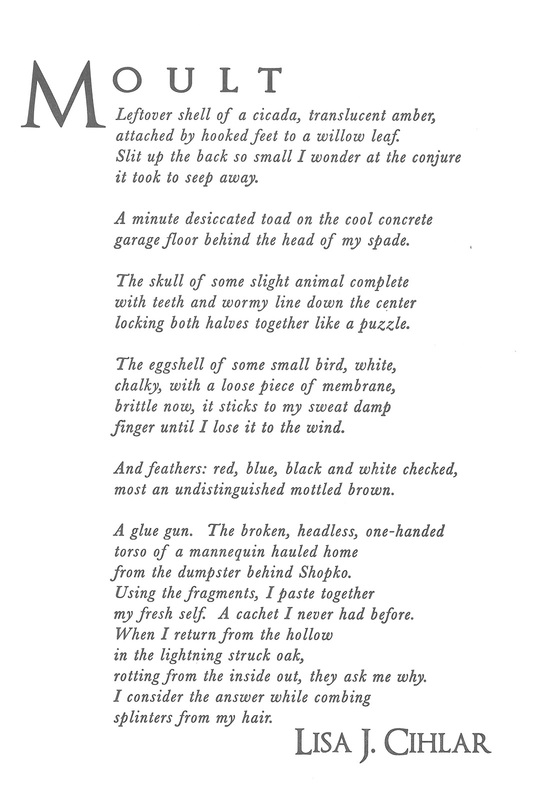 A cachet I never had before.” But selfhood is never that simple, never only cobbled together bits – it also emerges, sui generis, in this case from “the hollow/ in the lightning struck oak,” shedding splinters for someone else to find. It’s a beautiful way to describe what it means to be human. 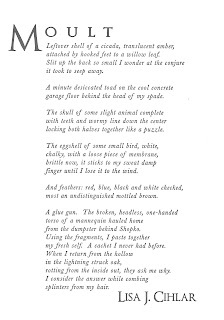 This poem meditates on transformation, more specifically on the remnants left behind and the hint they give about the shape of what continues. To amplify that movement inherent to the process, an italic was necessary, preferably in a classic typeface to reflect the durability of this type of struggle. Baskerville is just such a venerable face. The letters themselves squiggle and squirm; its italics allow plenty of white space around the letters, the suggestion of the space inside a husk. The typeface for the title and name needed to be similar but strongly anchored to balance the motion of so much italic. Optimus Princeps is similar to Baskerville in both its seraphs and its contrast between thick and thin strokes, but it remains distinct and achieves the desired effect. 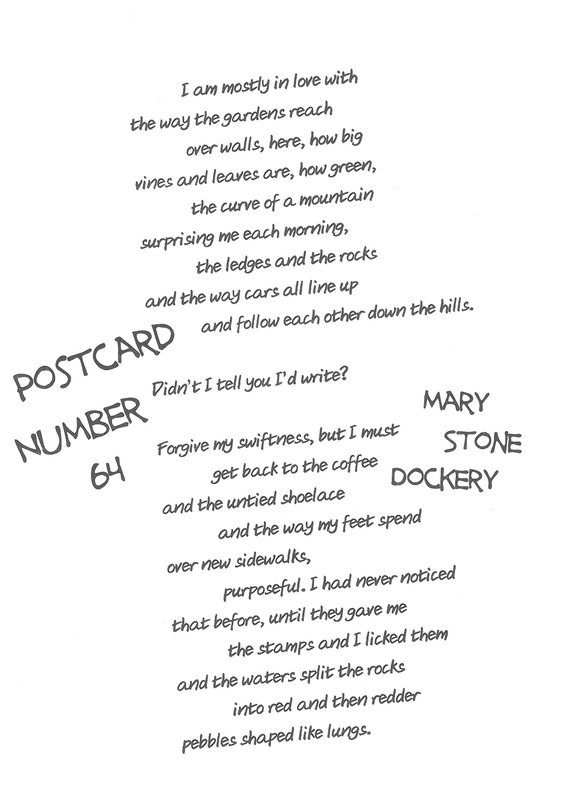 Mary Stone Dockery is the author of Mythology of Touch, a poetry collection. She is also the author of two chapbooks, Blink Finch and Aching Buttons,both forthcoming, as well as a collaborative chapbook, Honey and Bandages, co-written with Katie Longofono. Her poetry and prose has appeared or is forthcoming in many fine journals, includingSouth Dakota Review, Mid American Review, Arts & Letters, Gargoyle, and others. She currently lives, writes, and teaches in St. Joseph, MO. This poem is packed light for travel. That’s not to say it’s lightweight, more that it has jettisoned anything that might impede its leaps. And those leaps come as progressively more startling images. It starts in familiar enough territory, with the small surprises of a new landscape. But then it takes a breath (“Didn’t I tell you I’d write?”) and jumps, from the place itself to how the speaker is assimilating into it, how her “feet spend/ over new sidewalks,/ purposeful.” From there the speaker leaps from one peak of wonder to the next and it’s hard to know if the images signify inward or outward experience. Maybe it’s both. Maybe it’s not important to know. Maybe what’s important is how a solid, external thing like a pebble, because of its color and shape, can take on the qualities of a private, inner thing like a lung, and how that transfer works in the other direction as well. What’s outside softens and comes in; what’s inside hardens as it’s exposed. Are we in the speaker’s head, or are we in a physical landscape? Is there a difference? 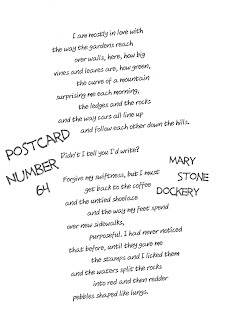 This is a postcard, a hastily scribbled note from a faraway friend. The slant of Aji Hand accentuates that haste, as do the tilt of the poem’s body and the block capitals of the title, squeezed into the remaining space, almost as an afterthought. All of it underscores the fresh energy of the speaker’s discoveries.